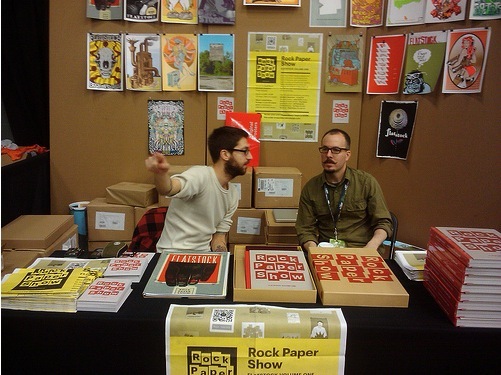 “Rock Paper Show: Flatstock Vol. 1”, new poster book feature! Click for more info or to pre-order "Rock Paper Show, Flatstock Volume One"
Holy smokes, we’re super stoked on this. At SXSW & Flatstock Poster Show in Austin, TX just over a week ago, a brand new and bitchin’ book made it’s debut: Rock Paper Show: Flatstock Volume One. Published by Soundscreen Design, this book on the rock contemporary rock poster scene has more specific bent & focuses on the Flatstock shows and posters artists’ Flatstock posters, which are created specifically for these poster events. Rock Paper Show is something of a visual history of the first 20 Flatstock festivals, (there have been 24 as the time of this writing, with 4 per year currently in Austin, TX, Chicago, IL, Seattle, WA and Hamburg, Germany) featuring interviews and essays by artists, collectors and bands, and a compilation of the posters created for the first 20 Flatstock poster shows. 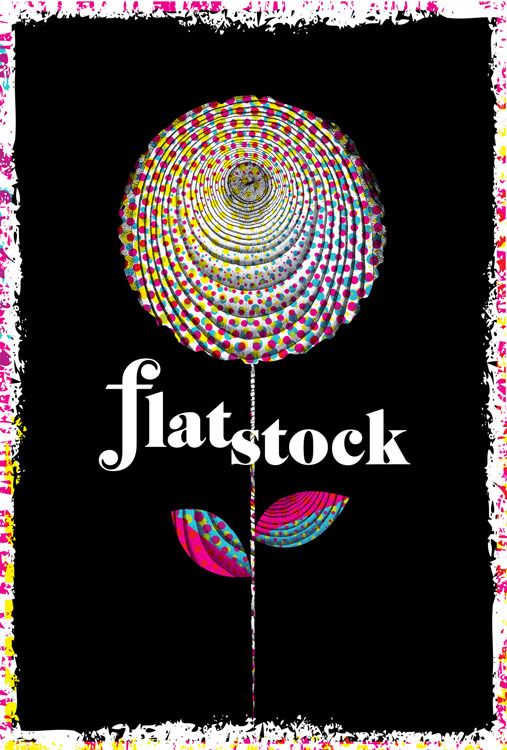 What is a Flatstock? Good question! The Flatstock Poster Show series is an ongoing series of exhibitions featuring the work of many of the most popular concert poster artists working today presented by the American Poster Institute (API). 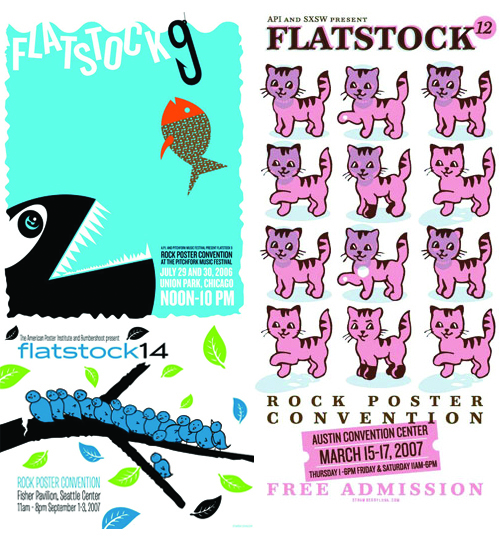 Flatstock shows provide the general public with an ongoing & unique series of opportunities to see fine poster art in person and to meet the artists who’ve created it — they provide the API with a way to present the poster artists collectively while showcasing the breadth of individual styles they represent. 3 of my hand screenprinted Flatstock posters featured in "Rock Paper Show"
In addition to the standard edition of Rock Paper Show, the limited, Deluxe Edition (produced & limited to just 500 sets) comes enclosed in a collector’s case in which you will find a hand-screened, letterpressed, or stenciled 11″x17″ set of 20 artist prints made especially for Rock Paper Show. The prints feature the original posters commissioned for the book contained within a custom portfolio folder. We’re incredibly honored that we’re among the artists asked to do one of these 20 posters, which are also featured as the chapter headers for each of the 20 chapters of Rock Paper Show. Here is a look at our poster below I will have a very limited number of these screenprinted posters for sale on my website later this spring. Flatstock poster for the book about the first 20 Flatstocks, "Rock Paper Show". Since its inception in 2002, Flatstock has evolved into the definitive showcase of the most talented poster artists working today. Rock Paper Show: Flatstock Volume One is an editorial and visual history of the first 20 Flatstocks, with contributions from the artists and studios that regularly attend the events and the bands who are often the subjects of the posters, as well as critics and collectors involved in this community. Rock Paper Show collects for the first time the original posters created for each Flatstock by the attending studios. Veteran poster-makers take the reader on behind-the-scenes looks at the studios, the artists, the regional scenes, and the personalities of this vibrant and varied community. Curated by Geoff Peveto (president, American Poster Institute). Designed by Rumors (Brooklyn, NY). For a full list of editorial contributors and Studio Index, please click here. Over 60 editorial contributors, including: Aesthetic Apparatus, Craig Finn (the Hold Steady), John Foster (author, Masters of Poster Design), Clay Hayes (gigposters.com), Jeff Kleinsmith (Patent Pending), Jay Ryan (the Bird Machine), and Paula Scher (Pentagram). Standard Edition – 312 pages. 566 color images. Hardcover. You can pre-order either (or both) editions of Rock Paper Show today by clicking on this link! Orders will ship in early May. Get a sneak peek at Rock Paper Show: Flatstock Volume One in the photo below where Soundscreen debuted at Flatstock 24 at SXSW Music Festival, or by clicking here. It’s a beauty.